Jackson High School robotics team cheering during competition. Photo courtesy of Everett Public Schools. From an Everett Public Schools April 12, 2019, news release. 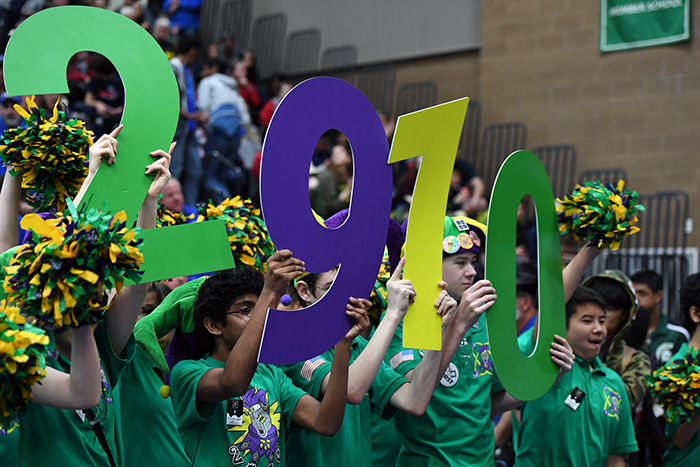 Undefeated this season and bringing home an unprecedented fourth win, Jackson High School’s robotics Team 2910 Jack In The Bot clinched the 2019 FIRST Washington Pacific Northwest Championship and are headed to Houston, TX for the national competition the week of April 16th to 21st. The Tacoma Convention Center was rocking with energy the week of April 4th through 6th as FIRST Washington hosted the Pacific Northwest Championship, which includes the states of Alaska, Oregon, and Washington. “The Jack In The Bot team faced intense competition throughout the event, but the drive team was more than up to the task,” said Maggie Thorleifson, Jackson High robotics advisor and coach. The team also earned the Quality Award that celebrates machine robustness in concept and fabrication. You can watch a recap video of Jackson’s robotics battles, alliances, and winning announcement by clicking on this link: YouTube Video. Click FIRST Championship - Houston - FIRST Robotics Competition - Newton Subdivision for more information and to stream competition in Houston April 16-21. 2019 Pacific Northwest Robotics champions from Jackson High School. Photo courtesy of Everett Public Schools. Jackson High School's cargo robot. Photo courtesy of Everett Public Schools.